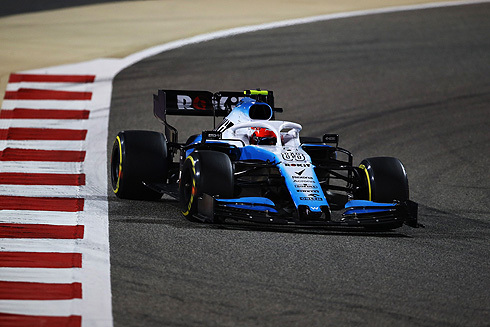 The results of the 2019 Bahrain Grand Prix would again see the ROKiT Williams drivers finish at the bottom of the times sheets with George Russell 15th and Robert Kubica 16th. 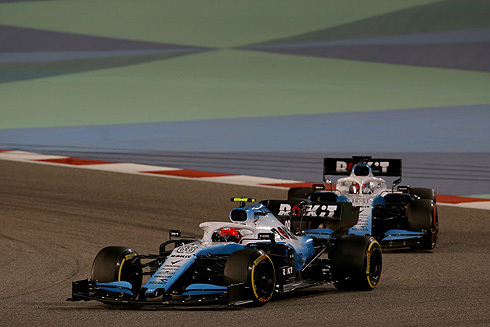 It was aagin a race that saw both drivers struggle for pace as they continued to have to cotend with n FW42 that has significant performance issues. George and Russell would spend the early part of the race fighting between themselves. Once again the both cars would make it to the finish which was a positive result in terms of reliability. 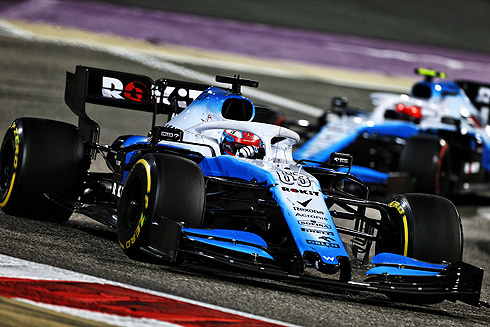 The fifty seven lap 2019 Bahrain Grand Prix would see the ROKiT Williams Racing team drivers start from the rear of the grid. On pole would be Leclerc followed by Vettel and Hamilton. Bottas would be fourth followed by Verstappen, Magnussen, Sainz, Raikkonen, Norris and in tenth Ricciardo. George Russell would be ahead of team-mate Robert Kubica in what was going to again be a difficult race for them. George would start the race on the soft tyre while Robert is on the medium. The rest of the field were on the soft tyre with the top ten on used tyres. The start of the race would see Vettel leading with Bottas moving into second. Leclerc was third followed by Hamilton and Verstappen. 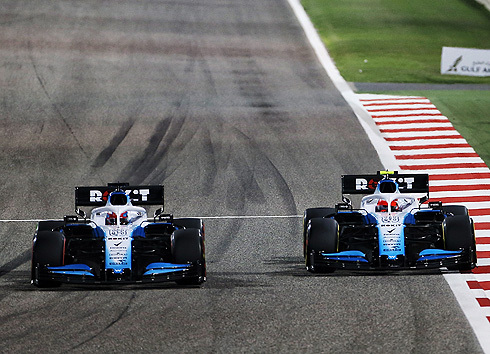 The Williams drivers were 17th and 18th as Stroll and Grosjean both pitted with Stroll getting new front wing and Grosjean a new set of tyres after suffering a puncture. Robert was running ahead of George but George would get past at Turn One. Leclerc was back in second from Hamilton and Bottas on lap three. Sainz would try to pass fifth placed Verstappen but the pair made contact with Sainz appearing to have a puncture of the right front. George and Robert were now in 16th and 17th as others had issues. Lap seven and Leclerc would pass Vettel using the DRS as Hamilton and Bottas dropped back from the Ferrari's. At the front Leclerc had opened out the gap to Vettel. The Williams drivers wre running close together with Robert still ahead of George with eight laps completed. Perez would pit seeing the Williams drivers now 15th and 16th making an early pit stop. More drivers were pitting changing from the soft tyre to the medium. This would see the Williams pair 12th and 13th if only temporarily. The pit stops would see Robert now 10th and he was on the medium tyre. But Raikkonen would get back ahead seeing him 11th and George 12th. But more drivers would pass the Williams pair. But Robert would also pit on lap thirteen changing to the soft tyre. George was still running in 12th but he would drop down the order. Robert was now in 17th as George pitted on lap 14 switching to the medium tyre. Lap 15 and the leader would pit changing to the medium tyre. Hamilton had also pitted taking on new soft tyres. Bottas had pitted coming back out behind Verstappen but he would get past seeing him now 5th while Ricciardo who had yet to pit was second. Vettel would pit from the lead on lap sixteen changing to the medium tyre. Lap 16 and Leclerc was leading from Ricciardo, Hamilton, Vettel, Bottas, Verstappen, Raikkonen and Giovinazzi eighth. Robert was now in 15th using his soft tyre while George was 17th. But Kvyat was able to get past Robert seeing the Williams pair 16th and 17th. Lap 20 and the order was Leclerc from Hamilton, Vettel, Bottas, Verstappen, Ricciardo, Raikkonen, Hulkenberg, Norris and Perez in tenth. Lap 24 and George was able to get past Robert with the pair still 16th and 17th. Vettel would get past Hamilton with Hamilton struggling on the soft tyre. Lap 29 and George would pit switching to new medium tyres. Despite this the Williams drivers remained 16th and 17th with the pair going a lap down. Lap thirty and Robert would pit taking on new medium tyres. He would return in 18th. Robert would eventually be passed by a recovering Sainz who had pitted for a puncture. Drivers started to make second stops with Verstappen and Hulkenberg coming in. Hamilton would pit on lap thirty six taking on the medium tyre, returning in fourth. Vettel would pit on lap thirty seven taking on new medium tyres. He would come back out in front of Hamilton. Leclerc would pit the next lap returning still in the lead. Bottas was now second as Hamilton attacked Vettel. After several failed attempts one pass would see Vettel fight but he would spin as well as losing his front wing in spectacular fashion as he returned to the pits. Stroll would pass George for 16th seeing the Williams pair 17th and 19th. Vettel would pit returning in 8th but he would pass Norris for 7th. The Williams pair were now 17th and 18th as Sainz had pitted allowing Robert to move up one place. The order was now Leclerc from Hamilton, Bottas, Verstappen, Hulkenberg, Vettel, Ricciardo, Norris, Raikkonen and Albon. Vettel would move up to 5th while Sainz would move ahead of Robert. But at the front Leclerc was to have engine issues that would see him slow seeing Hamilton pass the Ferrari. Such was the lack of pace of Leclerc that Bottas was now closing rapidly onto the Ferrari. The Williams pairs were now running in 18th and 19th. Bottas will pass Leclerc for second as Verstappen now closed in onto the Ferrari. In an amazing scene both Renault's would be seen off the track retiring. Ricciardo had suffered an electronic failure while Hulkenberg had an engine failure seeing him pull off. This would see the Safety Car been deployed. Sainz would also retire in his pit. This would see the Williams drivers 15th and 16th but Robert had gone two laps down seeing him behind Hamilton as they ran behind the Safety Car. The race would finish under the Safety Car with Hamilton taking victory from Bottas and Leclerc. Verstappen would be fourth followed by Vettel, Norris, Raikkonen, Gasly, Albon and Perez. For the Williams team they would finish in 15th and 16th with George leading Robert but Robert had made an extra pit stop the reason for this is unknown..